This graph appeared on my flickr stream today. I was surprised, both by the relative position of Metro Vancouver compared to the other Canadian metro areas, and the steepness of the decline. I do not usually get into the land use, density, urban design stuff but what I see from other blogs and discussions had given me the sense that somehow we were losing the battle against sprawl. I know that people are quite rightly concerned about large houses in the ALR – that people in Richmond now refer to as AirBnB hotels – and that so much recent development seems to have followed the freeway expansions into areas which were not identified as of the Growth Concentration Area identified in the LRSP. But what this graph shows is that the conventional single family home on its own lot – or one that shares a lot – is no longer the dominant form of the region. And that we are outperforming both Montreal and Toronto in delivering other types of residence. This is indeed good news, and a strong indication of why we not only need more and better transit, but that it will be successful because we have the density to support it. This also seem to be the subtext of a lot of commentary I have been seeing about why the BC Liberals did so poorly in this region. That includes, of course Peter Fasbender (former Minister for Translink) losing his seat (Surrey-Fleetwood). And the source for this graph (Neighbourhood Change Research Partnership, Factor-Inwentash Faculty of Social Work, University of Toronto) was new to me too. The photo was taken last week in Old Havana, on the Paseo Marti at lunchtime. We had found a restaurant on the roof of the Asturias friendship association’s building: they have a barbecue up there. I had a whole grilled red snapper, my partner the largest pork brocheta I have ever seen. We felt very lucky to be away from the cold of Vancouver, in a beautiful old city. Then I looked across at the other side of the street. 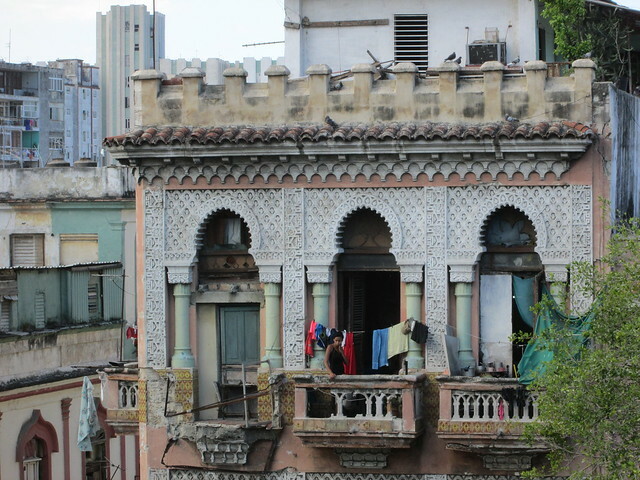 There are many old buildings in Havana, which tourists love to photograph. They are highly picturesque and a few have been beautifully restored. Many more are in desperate need of repair. Look at the balcony of the window to the left of where this woman is standing. The old rusted rebar is still there, hanging loose. The concrete has fallen away. Yet there she stands – and where she is standing is going to go the same way one day. Cuba has been subject to a lot of severe weather – many sites show the damage caused by hurricanes. These weather events are getting more severe and more frequent. Many countries are switching to renewable energy sources to try to limit the increase in the greenhouse gases that are the cause of the change in our climate. It is not just warming: it is sea level rise, storms and plagues. In its recent history Cuba suffered as a result of the US embargo. It had an ally in the former Soviet Union but that source of aid has gone. It used to rely heavily on Venezuela for its fuel but that country is now facing its own challenges. A Canadian company, Sherritt, has been helping in recent years to exploit the newly found oil and gas resources not too far from Havana in Matanzas, near Varadero – which is also a major area for all inclusive resorts where we also spent some time last week. We saw the huge chimney of the thermal power plant that now supplies Havana’s electricity – and it’s long plume of particulates. These add to the smoke from the open burning of sugar cane residues in the field after harvest. And the tailpipe emissions from old cars that never had catalytic converters or any emission controls and have now been mostly converted to diesel. I got through four packs of nasal tissues every day while in Havana. What we did not see – despite the sunshine and strong winds – were any photovoltaic panels or turbines. Someone told us they were in the plan for the future but were currently considered “too expensive”. She also said that Raul Castro has announced his intention to retire next year. There is much uncertainty over what may follow. My wish is that the people of Cuba will benefit from the long overdue improvement in relations with the United States as a result of President Obama’s decision to end the embargo. The main immediate effect of which was to end the opportunity of travel for Cubans to the US as refugees. Increasing uncertainty is unfortunately a major plank in the policy of the current occupant of the White House. Cuba is a poor country with many people who are underemployed: well educated but unable to find a way to utilise their knowledge, skills and willingness to work hard. Every embassy and consulate I saw in Havana is heavily fortified, not because Cuba is unsafe but to deter those who might climb their fences seeking asylum. My wish is for a better future for Cubans that is not dependent on the individual generosity of tourists, or the investment of more Canadian money in exploiting fossil fuels. A future which offers dignity for all. And safety in their homes. Not a precarious perch in a crumbling ruin. I wish I knew of a way of getting this message out to more people. I wish we could persuade our governments that waiting for chaos to break out – or even provoking it – and then offering shelter to a tiny percentage of the resulting refugees is not a tenable foreign policy option. That foreign aid is not just an easy target for spending cuts to allow tax breaks for the wealthy. That countries like Cuba are not simply a useful place to conduct torture that would be illegal at home – and is anyway ineffective. My wish is that countries like Canada and the United States will do something to tackle the gross inequalities that now characterize our world. Symbolized by the wealthy old white guy enjoying his expensive lunch while a young woman looks out from her window a few feet away and wonders what she will do next. Much later in the same day I wrote this piece my partner found an article by Michael J Totten in World Affairs entitled “The Once Great City of Havana” 3 December 2013. It is a Long Read but very thought provoking. And then I found this via twitter: of course if the first rule of SNET is don’t talk about SNET then posting the video to youtube was flouting the first rule and probably endangering the network. I see this as a sign of hope – especially if the authorities decide to leave it alone. Miro Cernetig in this morning’s Vancouver Sun on Michael Geller‘s proposal to adopt a new method of making housing affordable. Well, not new exactly but a new for here. It has been working in the UK for some time. It works like this: Most people — from the working class to the disabled — can no longer afford a house in Britain’s largest cities. With no grubstake from their families as a down payment, most people can only dream of ownership in the city. This has created a hollowing out in communities, what you might call the Manhattan urban model, where service providers and the poor are forced to the margins of the city. Then someone had an idea. Why not create “staircase” loans, a sort of hybrid between taking out a mortgage and a rental lease. A person would be able to take a quarter share in a property, say $100,000 of a $400,000 apartment. The bank, housing agency or developer would hold onto the rest and collect a portion of rent on top of the mortgage. With time, a person could up the quarter share to full ownership. If you talk to Geller, you will quickly find the financing model can also be used in more creative ways. Ownership could be targeted to service personnel, like firefighters and police officers, who now live outside the city where they work. Government could use the model to help the working poor get out of the rental trap. With a little creativity, it might even be used to help people on welfare move into the housing market. The point is of course that there has been very little done in this field in Canada since the federal government got out of housing altogether. And even less in BC where the province downloaded housing to the municipalities – knowing that they did not have any source of funding to make it happen. In other words, our poorest and most vulnerable citizens were made to pay for getting the country out of deficit. Or if you prefer, defeicits were seen as a wrose problem than homelessness. Either way a cyncial abandonment of responsibility for a quick political gain. It is not my original idea, but I do subscribe to the idea that the measure of a society is how it treats its most vulnerable members. Canadians like to think of themselves as a caring and compassinate society. That is, I am afraid, a delusion. Michael Geller is someone I like to think of as a friend. He recently twitted me for being too principled to run for office myself. Something that he is doing a a candidate for the NPA in the City of Vancouver. I do not have a vote there of course, but even if he wasn’t a highly intelligent, hard working and personable politician I would endorse him for this idea alone. Because it is long past time for politicians to start tackling issues like poverty and homelessness, and stop pretending that this is somehow beyond our power to help.